(Phys.org) —Plants use an enzyme known as "rubisco" to capture carbon dioxide from the atmosphere and, with energy from the sun and nutrients from the soil, build up the shoots, leaves, and stems that make up the plant itself. Scientists have known that for years. They also have known that temperatures are important. When it gets too hot, a rubisco helper protein called "rubisco activase" shuts down, photosynthesis stops, and the plant stops growing. Heat literally unravels the activase protein, and when it does, the result is a less bountiful harvest. Different plants shut down photosynthesis at different temperatures, and the process of unraveling the activase protein is known as "denaturation." Michael E. Salvucci, an Agricultural Research Service plant physiologist with the U.S. Arid-Land Agricultural Research Center, has teamed with Rebekka Wachter, associate professor of chemistry and biochemistry at Arizona State University, and Nathan Henderson, her postdoctoral research associate, to crystallize rubisco activase. Crystallization will allow researchers to study the activase protein more closely, to visualize its structure, and possibly to manipulate its sequence so that it doesn't unravel at higher temperatures. The findings could help in the search for genes that cue plants to synthesize more heat-stable versions of the protein. Crops with such enhanced proteins could thrive at higher temperatures. With climate change expected to alter landscapes and growing cycles, the work is considered all the more relevant. The work builds on previous research by William L. Ogren and Archie R. Portis, Jr., two retired ARS scientists who were based in Urbana, Illinois, and Salvucci, who worked with them as a postdoctoral researcher in the 1980s. The team discovered the existence of rubisco activase in 1985 and proved that it activates rubisco. For this and other accomplishments in the field of photosynthesis, Ogren was awarded the coveted International Alexander Von Humboldt Foundation Award. He was also named to the ARS Hall of Fame and to the National Academy of Sciences. Scientific teams around the world have been trying to crystallize rubisco activase ever since. "You need to know what the protein looks like to understand how it works," Salvucci says. For proteins, the tougher and more rigid a structure, the easier it is to crystallize. But the problem has been that most plant activase proteins do not have rigid or even regular structures. Wachter, Salvucci, and Henderson managed to crystallize the activase protein from the creosote bush, a shrub abundant in the Arizona desert. (The plant has no connection to the tarlike preservative found in many wood products.) They wanted to find the most temperature-tolerant activase possible, and they chose creosote because it can survive and photosynthesize at relatively high temperatures. Wachter's research is funded by a grant from the U.S. Department of Energy. The researchers suspected creosote's activase proteins would remain relatively stable under most conditions. They cloned the plant's activase proteins and reproduced parts of them that were stable enough that crystals could be produced from them. The results were published in the Journal of Biological Chemistry. 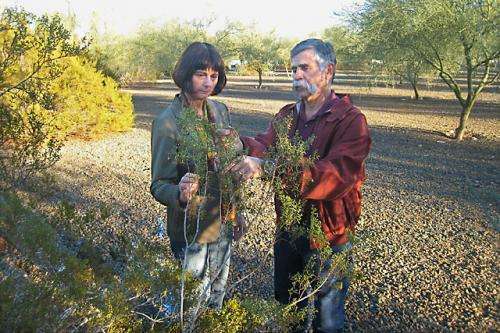 More information: "A Desert Shrub's Crystallized Protein Sheds Light on Photosynthesis" was published in the March 2013 issue of Agricultural Research magazine.